I ran the Moreau Lake 15k Trail Run at Moreau Lake State Park today. This was my first barefoot trail race, and what a great race it was! 35 people ran the 15k. The price was reasonable, and the trails were long and intense. The run consisted of a steep (that is an understatement) loop through absolutely perfect wilderness. Every step was covered with roots, rocks, sticks, and leaves. The ungroomed trails showed little erosion, with no signs of overuse. Looking around me at the starting line at the Moreau Lake Beach, there wasn't a single person there that you would want to mess with. The average age was much higher than a typical road race. In most races there is a smattering of all sorts of different people, but in this race it looked like a single unified team, Team Intense. I went the wrong way within 10 seconds of the race, and I got my first shout of, "that's what I get for following you" from a familiar face in the group. I found myself constantly asking, "Which way?!?" to the people around me at every intersection. The steepest section of the race occurs in the first few miles and is called the "Staircase of Death", a steep, rocky, and looong climb. I managed to miss the Staircase of Death, and instead ran up an identical yet less-travelled Staircase of Lost People, followed by two unsuspecting victims. After reaching the top and proceeding for far too long, it became clear that we had gone the wrong way and eventually proceeded all the way back from whence we came. I don't imagine that the Staircase of Death has ever been such a welcome sight as it was for us because now at least we were going the right way. After the staircases, it felt to me like the hill just kept going up and up. I should have listened to one of the front-runners when he said that he knows that the first section is horrible. What he didn't say was that the rest of the race wasn't much easier. There was the unmistakable sense that miles were moving very slowly, while time flew by. A few short miles into the race I already felt pretty worn out. I have done a 15k road race this year where I felt like a super hero from start to finish. During this race, I felt perfectly humble by the time I had completed the first 5k. I was tired and slowing, and my feet were politely requesting mercy. 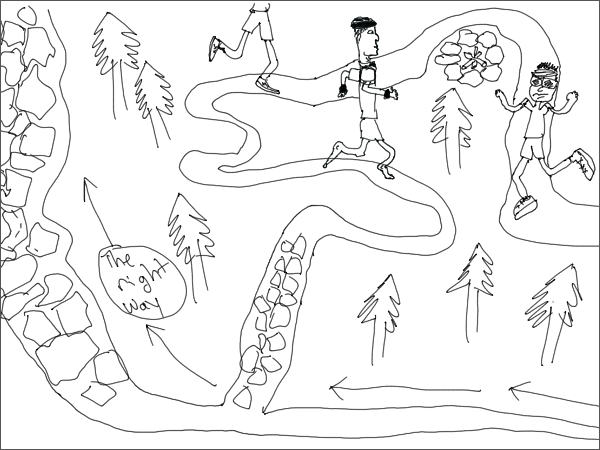 A notable phenomenon that only happens in a trail run and not in a road race occurs because leading the way and finding the trail is slower than following. So what ends up happening is that the person in front will build up a couple of people behind him. As soon as you pass someone, you become the slow one and people pile up behind you. You can feel the distracting pressure of the people behind you. I should be focusing going *my* speed, but instead I'm going a little faster, much like when someone is tailgating in the car. I know I shouldn't let it affect me but it does. My arrival at the only aid oasis brought the pain of knowing how much it took out of me to get to the halfway point in the race. I grabbed a few half-cups of water and proceeded on my way. The remaining course provided new challenges. Running downhill barefoot is really tough. On uphill and flat terrain, it is easy to play with your momentum to maintain a solid forward thrust. On downhill terrain, your best slow-down method involves reverse friction on the foot-bottoms, something my feet are definitely *not* conditioned for. Going out-of-control fast is not an option, because one fast heavy footfall in the wrong place would really smart. Dropping speed significantly is the only option, and still feels too fast. Another difficulty while running barefoot is caused by the fact that I am hyperfocused on the ground in front of me, carefully avoiding obstacles. There isn't a moment to spare to look up at where I'm actually going making it really easy to lose the trail. I lost it again on the second half, and once it's lost it's hard to commit to turning around. Eventually after not seeing any pink trail markers indicating the race direction for far too long, I turned back to find a group of runners going the right way. 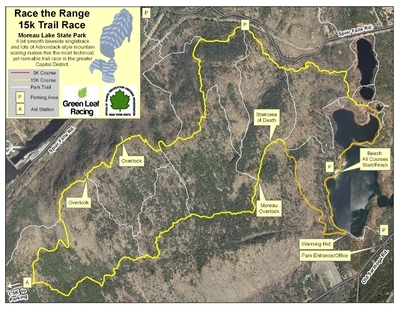 As I boldly ran past one person on the trail, she said, "see you at the gravelly section". She knew well that an upcoming section of nasty gravel was going to slow the barefoot guy to a crawl, and she was right. The gravelly section was tough on my now-sensitive feet, and she cruised past me while I whimpered my way across. Fortunately it didn't last very long, and soon we were at the final stretch of normal flat footpath, where it felt good to unleash the fast in me even if it was only for a short bit before happily crossing the finish line for chats, fruits, water, and a much-needed hug. Several dirt piles pimpled a friend's Long Island lawn. It turns out that the mounds are nests burrowed by cicada killer wasps. These two-inch-long wasps look intimidating but are generally not dangerous. The males are aggressive, but stingerless while the females have large stingers but are not protective of their nests like the bees and wasps that I'm used to. The stinger's primary purpose is to paralyze cicadas to bury with a wasp egg. The cicada serves as food for the grub when it emerges from the egg in a day or two. The following picture shows the cicada killer wasp burrowing a hole in the lawn, preparing to deposit a cicada and egg into the nest. The wasps dig impressively large dirt mounds, and fly around with cicadas twice their weight. Impressive little workers, these killers. A few years back a couple of friends decided that they were going to become 46'ers by climbing the 46 Adirondack peaks over 4,000'. I had completed several of the peaks giving me a head start, so I started joining them on many of their outings. Eventually I missed enough trips that I fell behind. A few weeks ago we hiked Colden and Cliff and I snuck off to complete Redfield as well, while H and A made plans to finish the 46 a few weeks later. By sneaking in one extra peak that day, suddenly it seemed vaguely possible to finish at the same time as everyone else. The next week, I made the solo trip to Rocky Peak Ridge. Then A needs Emmons which I also need, and H needs Haystack and Marcy. I need 2 peaks next to Marcy. This will be chaotic, but it is doable. We discuss plans. Saturday we will day hike 3 mountains in the Seward Range. Sunday we will resupply and start at the Garden and work our way toward the base of Marcy. Monday we will split up and hike our separate peaks, and plan to meet at the top of Marcy to celebrate the completion of the 46. A, J, JQE, and I get up early and drive to the parking area for the Seward range. H is planning to show up later and runhike to catch up with us later in the day. It is a beautiful day, and the four of us thoroughly enjoy chatting as we make our way to the Caulkins Brook along easy horse trails. We pause to question a few turn-offs, but confidently press on until we reach the trail kettle marking the beginning of the Caulkins Brook Trail that will take us to the intersection between Donaldson, Seward, and Emmons. Three of us only need to check Emmons off of our list, but JQE needs all three. He has little confidence that we are going to accompany him on the extra portion of his hike. He begins to question whether there will be any water on our way up the mountain and he is going to need it. "Hey do you guys want to stop and get water?" These thoughts gradually elevate. "The water looks tough to get to here, and we don't know that it's going to get any easier". Everyone shrugs. Eventually with near panick in his voice, the decision is made. "You guys go on ahead. I'm stopping to get water." We roll up the hill at a good pace, bumping into a Utica DEC worker along the way. He tells us that pretty soon there will be no more places to get water so at this point all of us take a good break to snack, refill, and get ready for the tough part of the hike. While we rest, H comes bounding breathlessly up the hill. There is great rejoicing as the fellowship is now complete. Let me just say here and now that as a group we are completely incapable of making plans and sticking to them. Originally we were planning to camp out for a night or two while JQE completed 4 peaks. Suddenly the trip switched to a 3-peak day hike. We still aren't decided as to what we are doing. Which peak will we do first? Is everyone going? The five of us work our way up the final steep section to the intersection atop Donaldson between Seward and Emmons. Someone stops and asks us the tough questions. "Where are you headed"? The question helps everyone discuss and solidify our plan. We realize that if we do JQE's peak first, then there's no question that we will stick together. If we do it in the reverse order, then we'll all be tired, and since we have already completed Seward, 4 of us will have little motivation to press on, leaving JQE to hike solo. He deserves company, but we are weak-minded individuals, so the only way to obey the Golden Rule and treat him the way we would like to be treated is to manipulate ourselves by doing the optional peak first. We sit and try to eat some lunch, but end up feeding the bugs instead. Most of us drop our packs and some of us drop our shoes, and begin scurrying over to Seward. The way is slow-going, and a bit difficult. We encounter several groups of hikers along the way. We spend some time reminiscing at the top of Seward. J and I had actually spent a panicked night up here at the peak following a disastrously long hike on our previous attempt, much to the dismay of people that saw us hiking up near dusk. J pulls out his cell phone and works out our reservations at tonight's hotel. He says that we are hiking and will be a little later than we had planned, and she tells him, "walk faster!". We get motivated and hike back to the main intersection just below the peak of Donaldson. This marks the end of our first wind, and frankly I don't think that a second wind ever comes. We regroup at the top of Emmons where A pulls out a bottle of champagne and we all celebrate his well-earned completion of the 46. It would have been sad to have missed A's inauguration, and all of us can feel a shared pride in congratulating our good friend. The celebration, however, provides surprisingly little consolation for the long hike out ahead of us. The hike back to the car feels much longer than it should. It begins with several steep drops and climbs on the way back to Donaldson, but fortunately gets easier with every milestone. J and I lose the trail once, and start hiking in the wrong direction. We realize our folly, and turn around, only to lose the trail again. We are both exhausted and easily fall into a panic, but eventually correct our direction. As the hike gets easier, sore knees and tired feet slow us to a crawl. The only thing keeping us moving now is the knowledge that we are quickly approaching two very important deadlines. If we miss our check-in time at the hotel, it will mean the most expensive homeless night I have ever spent. More importantly, after 10:00, the Lake Placid Pub and Brewery will stop selling burgers. We limp, nap, and crawl our way back to the car. After we reach the trailhead exit not a second is wasted. We make a rolling start to race along the dirt road into town, making calls, desperately trying to secure our seat before the burger. We will be just a few minutes too late, but the other guys order food for us so that when we arrive at the pub the food is on it's way. Hallay freakin' luyah. J and the nice lady at the hotel nearly kill each other. You see J left his credit card in the car which is 20 feet away. He has walked a gazillion miles and cannot walk another 20 feet. The nice lady really needs J's credit card. This is clearly a travesty of justice, because he gave her his credit card number earlier over the phone. You can see the impasse. Today's battle is won by the lady and we head to the pub with our room precariously secured. A alone has earned his 46'er Pale Ale. We finish our meals and a quiet and early night. The next morning, three of us wake up in our hotel room. J and I passed out in our individual double beds. H lay awake all night, back bent like a taco in a fold-up cot provided by the hotel lady for a small fee. Not even the sweet sound of sawing logs emanating from the two comfortable beds was enough to lull him to sleep this night. We sleep in. H has spent the last 8 sleepless hours working out his plans for the day, and all his priorities point in one direction: the laundromat. He wakes, up, collects everyone's clothes, and heads to the laundry to start the process. We all shower and waddle to the nearby diner. I bring a map. Adirondack Breakfasts nearly all around replete with hotcakes, meat, eggs, and toast. There is room enough on the table for half of our food and no map, but we quickly eat our way through enough food to make space to continue to argue over the map. We head out into the busy streets of Lake Placid, where our sore and cranky fivesome spend most of the rest of our day at a standstill endlessy arguing over plans that we will never follow through with in the hot sun. We run to EMS for shade and lots of new equipment. JQE forgot a raincoat, and the two of us discuss ALL the pros and cons of buying a new raincoat vs. potentially suffering without one. He picks one up. The rest of us stock up on mosquito nets, citronella candles, and various other items we could never live without. Back outside in the hot sun again, we continue to argue. 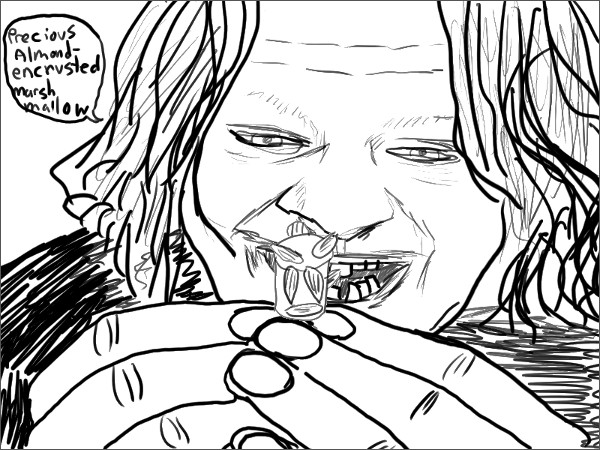 It is becoming clear that with every second that passes in this corrupted sunny hell city, the fellowship approaches collapse. Momentarily, A sees through the fog of his building rage that we need to buy food and get into the woods to move this trip forward before we kill each other. After a quick stop at the supermarket, we are finally on our way. There are three Stewarts Shoppes during the short drive from Lake Placid to the Garden parking lot. For the life of me I can't remember what for, but our caravan stops at all three of them. At a red light everyone gets out of their cars to discuss plans. In order to leave options open, the fellowship is broken, allowing us to split up if need-be. This means that J and I will need a bear canister, so we stop at the famously expensive Mountaineer and buy one before heading to the trailhead. The five of us make quick work of the 3 miles or so to John's Brook Lodge. JQE points out several mushrooms along the way, including some nice fat stemmed bolete-looking mushrooms that stain a dark purplish-black upon touching. We reach JBL and take a seat at a picnic table. This is our point of no return, where we have no choice but to turn all our past arguments into decisions. The floodgates open, the discussions commence. To keep a long story short, we are loud and so wrapped up in our own worlds that we remain oblivious to the fact that the lodge is a busy yet quiet place, not unlike a library, only now we are more disruptive than contestants on the Silent Library. In fact several people are reading in adirondack chairs and are so polite and laid back that we don't even get a well-deserved "shhhhh". Before long a ranger comes by saying, "it sounds like you have a lot of plans do discuss". He offers suggestions and helps us reach our conclusion. We will hike together to Bushnell Falls. We pack up our stuff and move along. We set up camp around the Bushnell Falls lean-to. There is a nice pool in a nearby stream for cleaning up and soaking sore legs. After a leisurely dinner, the maps come out again and final final plans are finally solidified. J and I will head over Marcy to Gray and Skylight. The rest will visit Haystack and Marcy. Afterwards the five of us will all meet atop Marcy, and we spend some serious efforts to try to predict how long it will take. J and I will need a few extra hours to complete our hike, so the two of us will wake up at 5 and start hiking while the others can sleep in a little. The next morning, the two of us head out. The trail, as it turns out, goes directly through our campsite. We lose a half-hour probing everywhere but our campsite looking for the trail, but after that the walk to Marcy is speedy and pleasant. It is the earliest I have ever been on the trail. Along the way, I hear the sound of an animal growling at me from the brush. It sounded like an irritated house cat when it growls just before hissing and clawing only with a lower pitch. I'm not sure what it was, I've never heard anything like it before. 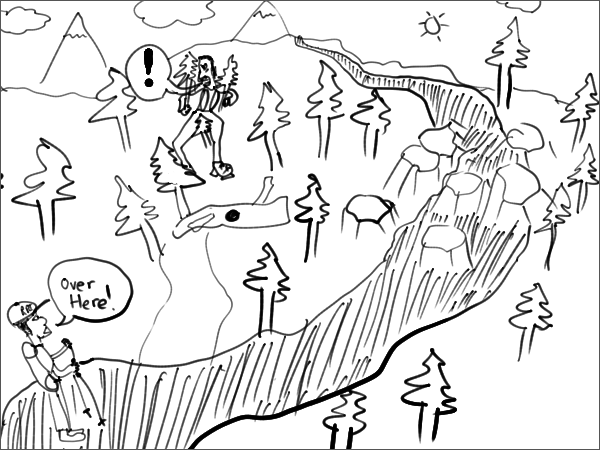 Near the peak of Marcy, we meet The Reluctant Steward. He is a character. He sits on a rock with his pack, tired and needs a pep talk to get him moving the rest of the way. He has a lot of things to say, most of them hilarious. He is hoping for lightening so that he doesn't have to go up to the top. We head up the mountain. At the peak, J's cell phone works. I get online and find JQE's phone number and we leave them a message to let them know we are a bit ahead of schedule, although after Gray we will be a bit behind again. Heading down Marcy's backside, a light rain falls enough that I pull out a raincoat for a little while. I reach the four corners between Skylight and Marcy. Our next peak will be Gray, for which the trail is unmarked. At this moment I realize that I have no basis for my assumption as to where the trail is. It seems like it should be somewhere near my current intersection. I decide to leave my pack behind and scurry around looking for the trail. I take off, sniffing every nook and cranny for a secret trail over the next 10 minutes. Finally, after the Lake Tear of the Clouds, I find it, a clear but unmarked trail towards Gray. What a relief. I return to find Joe waiting. We meet a really friendly, energetic, and enthusiastic couple on their way up Skylight and discuss our plans. We expect to meet again, as they are heading to Gray afterwards. J and I head up Gray. The going is really tough. 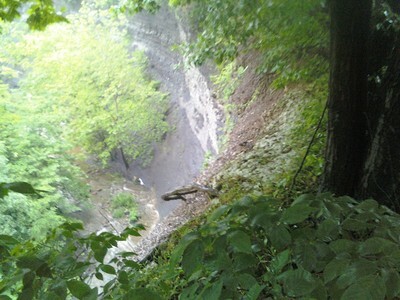 We come across a very steep cliff. Plan A is to make a straight shot down the cliff. 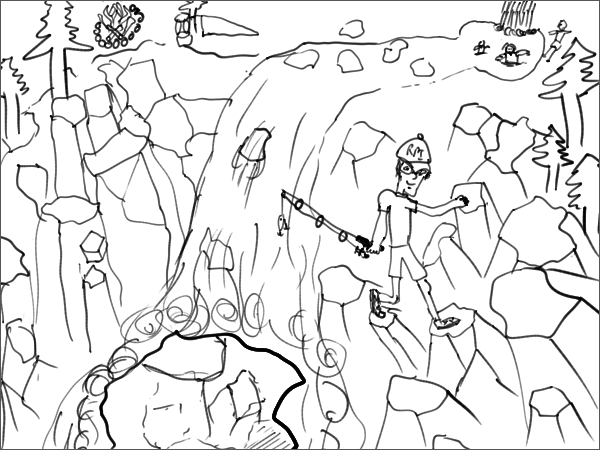 J's boots refuse to grip the near-vertical rock and he gets into a panic, scrambling back up to the top. Refusing to take another look at the nasty climb, he jumps hastily to plan Z. From above I can hear thrashing and crashing through thick, steep, and gnarly brush. Moans, groans, cries of pain and suffering echo throughout the forest. 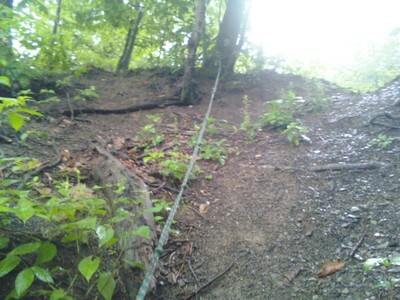 Eventually from the trail I can see J at the top of a very steep and thick obstacle course. He is in full panic mode, and is yelling my name unable to see me. I yell back until he finally looks down and our eyes meet. If he can get through 10 or so feet of impossible hell, there is a relatively clear path the rest of the way. 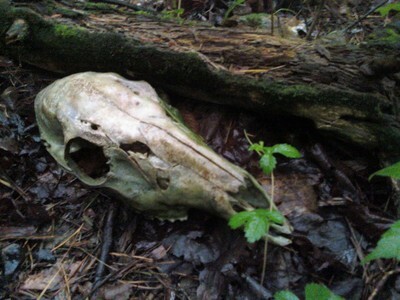 He whacks his way down and returns to the trail, bruised and battered, with our sanity luckily still somewhat intact. It's going to be a long day and we're going to need it. The rest of Gray is very challenging, but that last cliff was the worst of it. The remaining impossible sections have slightly easier alternate routes. The going is slow, but we make it to the top. I point to a distant peak and say that Gray is just over there. J nearly decks me. I knew as it was coming out of my mouth that it is not a good time to make jokes, but somehow that just makes it come out all the more quickly. 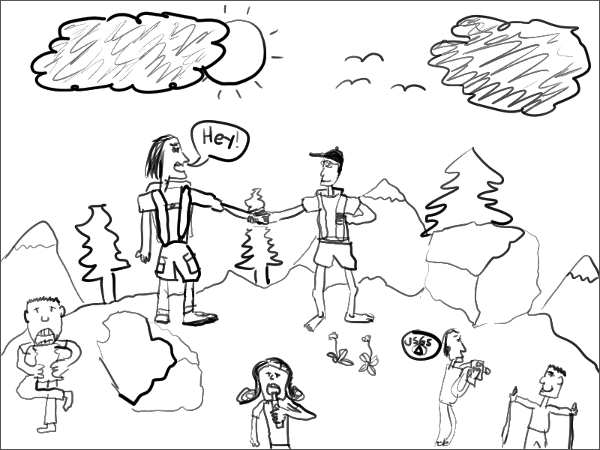 We hike back down to Lake Tear of the Clouds, and I see the nice couple we met earlier, only now they are not quite so... friendly as I remembered. I say, "Hey, you made it! How was it?" They barely look my way and respond, "ummm, it was ok I guess." I say, "How is the trail to Skylight?" They have no idea what I'm talking about. At this point I realize my mistake, they are a different couple, and so far have only made the short hike from a nearby lean-to. I continue on my way, embarrassed. Before I get far, I hear J having the same exact conversation repeated. I feel better knowing that we both made the same mistake. We stop for a snack at the base of Skylight and meet the actual couple we were expecting to see, and they were as jubilant as ever. We hike up Skylight. I can't begin to tell you what a cakewalk it feels like after Gray. It is a smooth and steady trail, and we are at the top of this breathtaking peak in what feels like a few short minutes. This marks my official completion of the 46, and this is a perfect place to spend it. Marcy and Haystack are probably the most impressive two peaks with their enormous bare tops, and Skylight is the perfect place from which to view them. J and I are both elated to share this momentous occasion, and we sit and take in the views and enjoy a bit of a celebration before heading back down. Before long, we are near Marcy's peak, a few minutes behind schedule. As we approach the top we are greeted from above by A waving at us. At the top, we all shake hands and give high fives and all that. We pop open some champagne and pat each other on the back. We spend a good amount of time up there, and everyone is getting chilly. I pull on a warm shirt, and suddenly get the uncomfortable feeling that everyone is staring longingly at me. I ask what the look is for, and those guys have been waiting on top of the chilly peak and are freezing and don't have any clothes besides shorts and t-shirts. I offer someone my shirt, after which the others rifle through my bag and find a windbreaker and a winter cap to borrow. We're all carrying the same-sized bags, so I am curious to know what is in them if not any warm clothes. But I digress. We truly have a merry time at the top of Marcy, but eventually we must begin the million mile march back to the car. It is pretty much every man for himself at this point, and we leap frog each other back to Bushnell Falls, then to JBL. The last 3.5 miles are horrible and take forever. We have been flat out hiking since 6am. It is now sunset, and we are hit with a nasty thunderstorm at which point I learn that J has an irrational fear of being struck by lightening. He breaks into a full-tilt run for the next mile or so down the trail as a means to avoid the inevitable electric zap that he knows is coming. We see a bear on the trail. Or we hallucinate. Neither of us can trust our senses at this point, but not taking any chances we make lots of scary noises to chase away any danger before proceeding. I notice a few amazing mushroom patches that I'd swear were not there on the way in, which suggests to me that they may have sprouted during our hike. 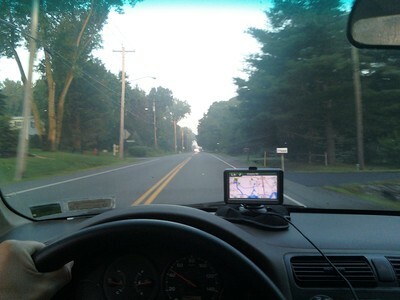 After an eternity we reach the car and zoom to the Ausable Inn. They are no longer serving food, but we might be able to get a meal at the Baxter Mountain Inn. We hustle and arrive just in time to receive a glorious blessing - a friendly bartender, a delicious burger, and a big thirsty beer. My gratitude has never in my life been so deep as it was at the moment when these gifts were placed before me. After this, nothing matters. We drive home, sleep, and I head to work the next day, pretending to be a normal dude in a normal work day, even while my head is still at the top of Skylight enjoying endless outrageous adventure in the beautiful Adirondacks. Friends are completing the Adirondack 46 next week, and as luck would have it I have squeezed in enough extra peaks that I can finish with them, I just need to get Rocky Peak Ridge out of the way. That is my goal for today. I slept in, slowly got ready, and drove to the Giant Mountain trailhead. There were 30 cars lined up along the road. I passed a few parked cars looking for a sweet spot, and found one. As I drove close alongside the car in front of my intended parking spot, I was startled to see a dude in the driver's seat of the car in front of me. It was a relief that he didn't open his door at that moment, I would have crashed into it. I parallel parked behind him and headed toward the trail. By now he was outside the car wearing a towel, probably changing into shorts. "Look, he's barefoot. He's tough!" "Barefoot, is that the new thing now?" Early in the hike from up ahead: "blah blah blah waaah my ankle! blah blah blah". Uh oh, meeting these people in barefeet can sometimes get ugly but luckily not this time..
On the second meeting: "You're *still* barefoot?!" And from another one: "I still don't know how you do that". And of course, the best of all, at the top of Giant, the run-walking dude comes up and shakes my hand. 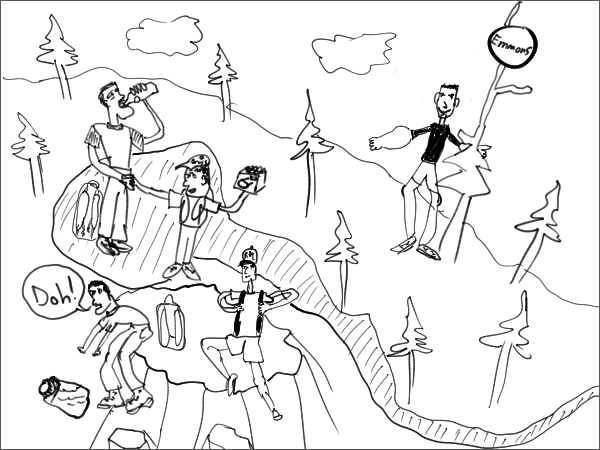 He says, "Everybody was asking me the whole way up, are you with the barefoot guy?" We talked for a bit, and I headed towards Rocky Peak Ridge. It was a steep descent, and I slowed to a normal pace as my feet were feeling the friction. The dude passes me so of course I pick up the pace again. He's really pushing me to find my speed. My feet suffered four separate "toe crackers" as H calls them, on four different toes, a really easy way for a barefooter to break a toe. Allow me to explain. While hiking it is common for the feet to brush up against rocks, sticks, or trail sidewalls, sort of like tripping but without any kind of fall. In shoes recovering is easy so it's a total non-issue, but while barefoot you are tripping over your toe. The body's momentum is getting absorbed by one tiny little toe, so it breaks. Today I suffered toe crackers on four different toes that I would have expected to put me out of commission. However, today I realized that my feet are getting stronger and are actually getting unexpectedly conditioned to handle toe crackers. At one point after a toe cracker, I was feeling the pain. I looked down and saw blood and let out a mental cheer. The blood means that the source of the pain was a cut (which will heal quickly) and not a broken bone. The wife and I still have yet to do any grocery shopping since returning from our vacation last week. At the top of Rocky Peak Ridge, I eat the only foods I could find at the house: almonds and marshmallows. This is my second hike that I have brought this trail snack on. Along the way, the bag gets shaken, heated, and mashed. By the time I eat the large marshmallows, they are encrusted with whole almonds. Generally, everyone is gracious and steps aside after you catch up to them, in which case passing is a non-event. One guy with boots and poles was moving at a good clip, but I was intent on chasing down the dude ahead of him, so I wanted to get around him. For 5-10 minutes, he saw me, but did not pause to let me through. I politely kept my distance behind him for a while, but eventually started tailgating. I tailgated for a long time before he finally stepped aside. It turned out that he happened to be tailgating the dude from the car, which explains his determination, as he was intent on joining the unspoken competition. I walked past him, then passed the other guy while he sat down for a quick break. We are now descending Giant. Thunderstorms have brought lightening, thunder, and pouring rain. The dude passes me, jogging effortlessly down the hill. I keep up halfway down the mountain, but in a single moment my feet transition from invincible to tender. After a certain amount of abuse, the magic juice that makes bare feet tough eventually breaks down or gets used up like fuel. Like a stubborn old nag, they refuse to go on like this any further. Suddenly, I can feel each of 20 pebbles digging into my feet with every footstep. I have no choice to slow to a hobble, quietly whimpering to myself the rest of the way down. Nothing's hurt or injured, it's just that the nerves in the bottom of the feet are screaming "jesus god enough already" so loud that it's impossible to ignore. I make my way to the car, at which point the dude is long gone. On the drive home there was a fair bit of traffic. I passed an agile muskrat probing out onto 87 repeatedly looking to cross. Clearly he had not yet gone to Safety Town, where I learned to safely cross a busy street. Sadly it was a missed opportunity to pull over and capture the event on video to see how quick of a self-learner the little guy turned out to be. It's probably just as well not to have gotten it on video. Last night we received an incredible amount of rain during a short period of time with vicious thunder and lightening. I expected the water level to be very high today, and what I found was the opposite. The put-in in the video below looked like pure rocks, with a bit of water winding it's way between them. 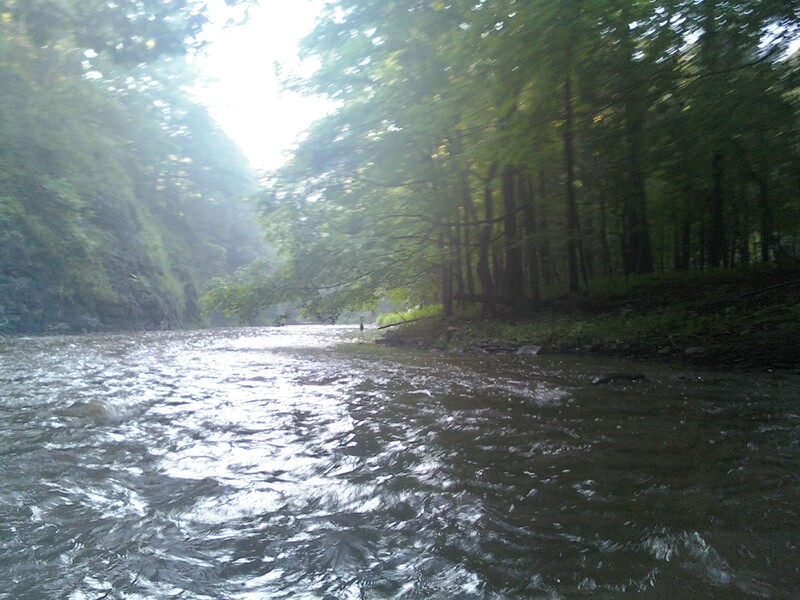 I scraped bottom almost the entire way, making for an unpleasant day of kayaking. 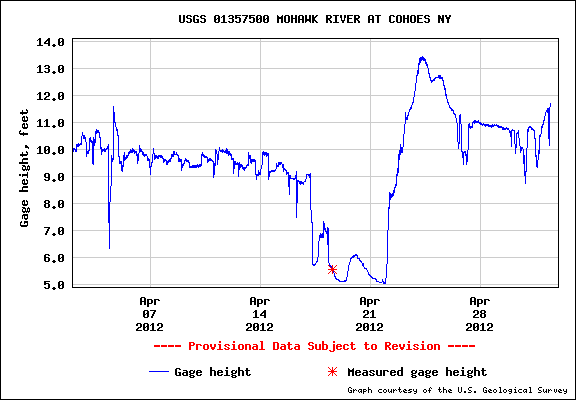 The USGS Gauge on the Mohawk River in Cohoes was at 6,000 feet. I repeated this route in May, 2012. I have been keeping an eye on the USGS water level for the Mohawk River in Cohoes with the assumption that the water level in nearby waterways is related. I would expect that the water level in a smaller stream would rise and fall faster during and after a rainfall than the Mohawk because the Mohawk is collecting water from a large area, including delayed influx of groundwater and distant upstream tributaries. 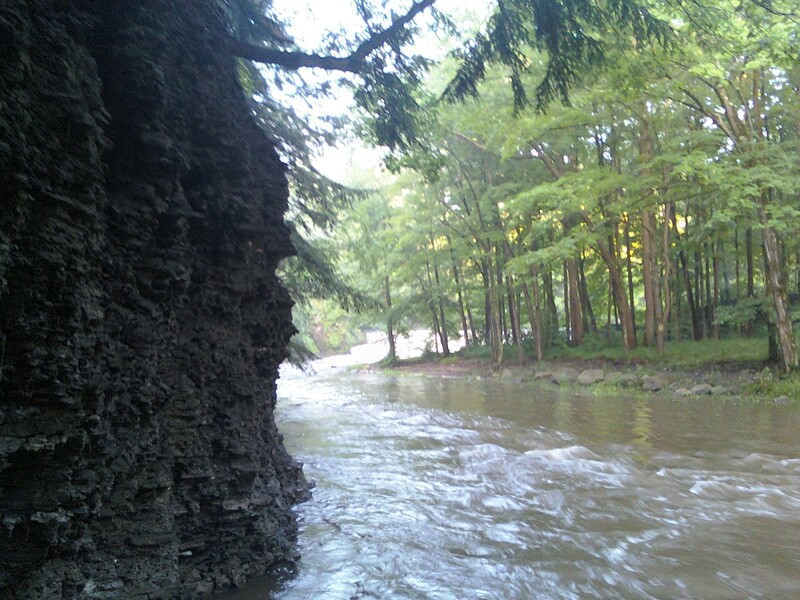 Today the water level on the Alplaus Kill was a bit on the low side. There was a good amount of water, but in the shallower sections it was scratchy. I was able to kayak without getting out of the boat to walk but I had to push myself over a few rocky sections with my hands on the ground. The reading on the 30-day graph of the water level on the Mohawk River in Cohoes is 11.5' (8000cft/s). Despite the elevated level on the Mohawk, I *think* that the water level this time was significantly lower on the Alplaus Kill than last time, although I am only going on the descriptions so I am not sure. The waterfall on river left was actually flowing more heavily today than in the above photograph. Perhaps distant rainfall affected the Mohawk without affecting the Alplaus Kill. That being the case, my assumption that the water level on the Mohawk is related to that of the Alplaus Kill is not exactly correct. 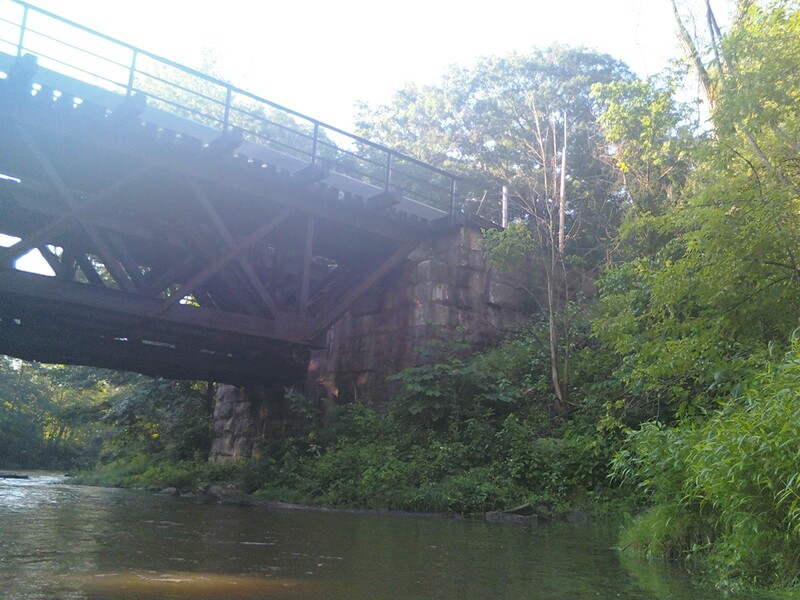 Today I kayaked down the lower part of the Alplaus Kill from just below Crystal Falls downstream from Route 50 to the Mohawk River. I headed out early this morning before work. 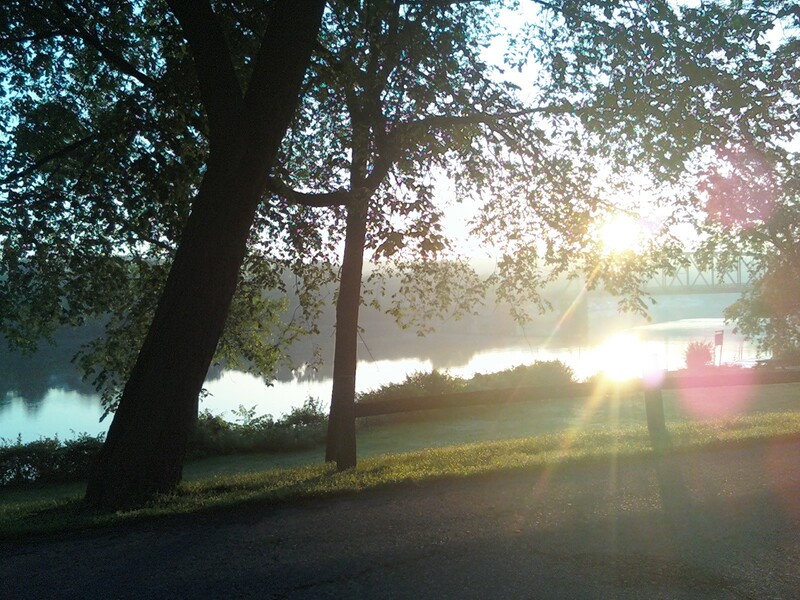 I parked my bike at the public dock near the Boat House in Niskayuna. I had a place in mind where I was hoping to access the riverbank, but the small road leading down to the path to the river was gated with "no parking" signs along the way. 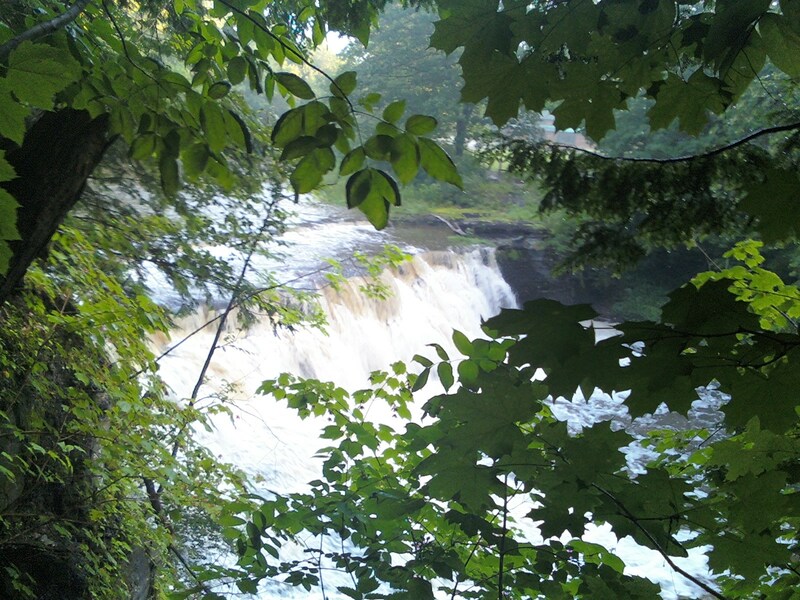 I scouted around for another way to access the river, and checked out Crystal Falls. Here is a picture of the falls taken downstream a short distance. Eventually I found a way down to the river, although it was rather difficult. It was a bit of a struggle getting the boat to the water, but luckily somebody had left behind a rope that was worked well enough for easing the kayak down a very steep hill. It rained a bit last night, so I was hoping that the water would be high (but not too high). 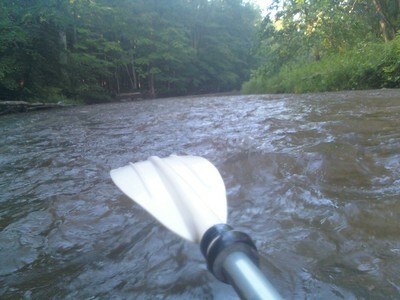 I kayaked my way down, and there were really nice rapids along most of the way. 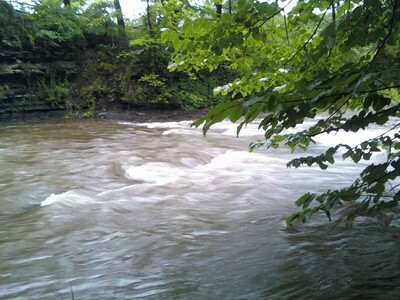 It was not difficult to stay in control, so the rapids felt safe. The water was generally nice and wide so fallen trees in the stream were often easily avoided. There were a few log jams that I had to get out and pull the boat around. The water was generally shallow enough that bailing out in the case of an emergency always seemed like a reasonable option. There was a nice waterfall along the way. 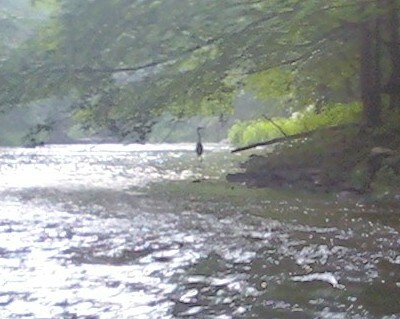 A great blue heron leapfrogged down the river. I would catch up to him and he would fly down the river a short ways, and we repeated this process for quite a while. There were several areas where the rapids were more fierce than this, but unfortunately I was too busy paddling to stop and take pictures of the more exciting rapids. 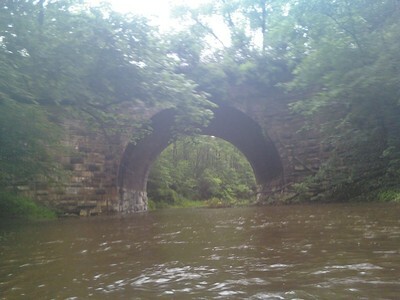 There was a railroad bridge along the way. I took a picture of a log that I had taken a picture of on my last trip in order to get an idea of the water level difference. It looks like it was only a little bit higher the other day (left) than it was today (right). 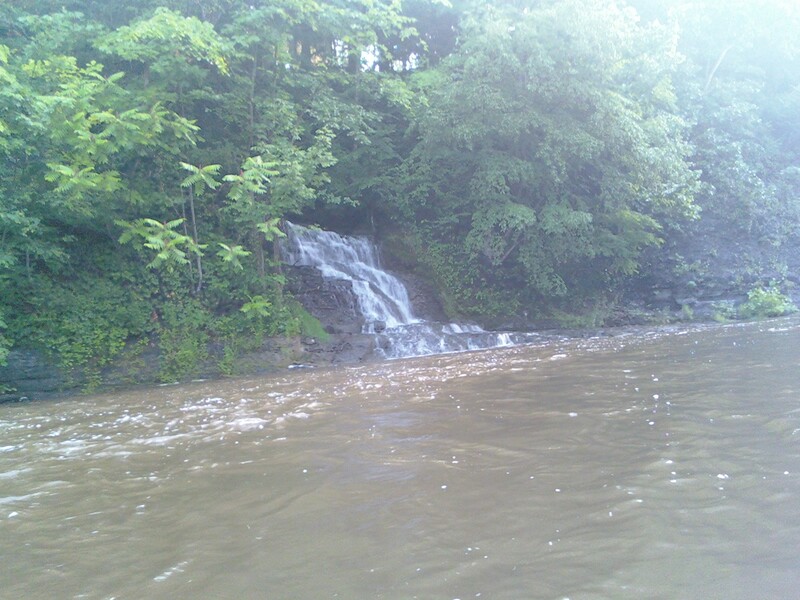 Eventually I reached the confluence of the Alplaus Kill and the Mohawk River. It was a short paddle back to the public dock and I was done! This was probably the best trip I have taken so far, not including the difficulties with getting to the put-in location. The trip was fast moving and exciting, but not scary. According to the book I have, this section of water includes Class I and Class II rapids. 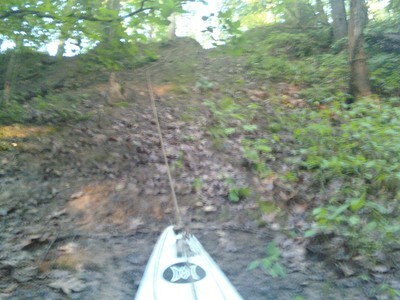 I set out to kayak the Alplaus Kill before work this morning. I'm not generally superstitious, but today there were too many signs to ignore suggesting that today was not my day to take any unnecessary risks. If something terrible happens to me sometime in the near future, let it be known now that I was warned. In the meantime I plan to walk a little more carefully than usual. 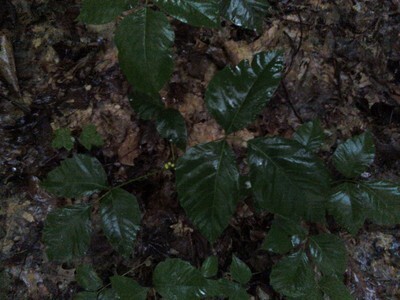 Before I reached the falls, I came upon poison ivy (or at least something that looks a lot like it). There was no avoiding it if I were to press onward. My bare legs would not allow me to continue. I headed back to the car, and drove downstream a bit to an area past the waterfalls where I thought that I might be able to access the stream. On my walk through the woods towards the stream, an intimidating trail marker warned of unspoken dangers ahead. When I reached the stream, I found myself standing atop a 100 foot cliff looking down at the water below. A rope down the steep slope invited me to climb down to get a better look. After exploring the stream for a short while, I hiked back to the car, and drove to a bridge just a short distance upstream from where I was planning to exit the water. 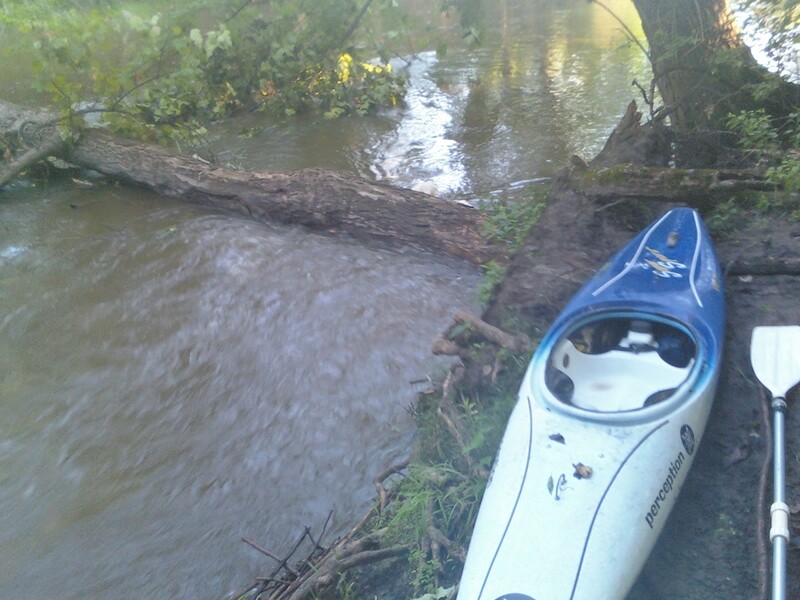 I put the kayak in the water, and paddled down the stream. I encountered a couple of log jams along the way that I had to climb out and pull the boat past. The ride was peaceful and quiet. 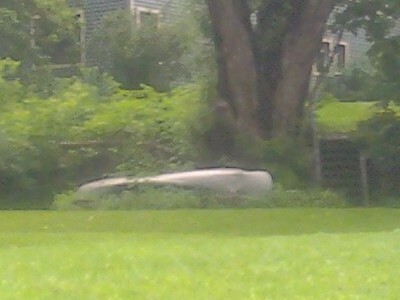 Along the way I came across this crushed aluminum canoe, yet another sign of foreboding for my trip. It wasn't all morose. 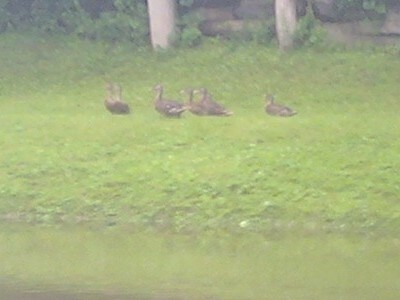 I saw ducks. They were cute. I think that this might be a great place to kayak on a calmer day. I need to scope out some places where I can put-in perhaps past the water falls just after Saratoga Road. 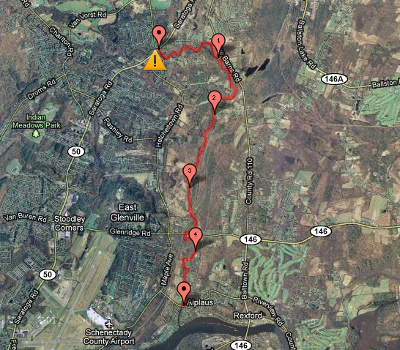 My planned route started at the Saratoga Road bridge, and ended at the Alplaus Road Bridge, at mile 4.8. After seeing how the river looked after the heavy rains, I put the kayak in the water at around mile 4, so I only kayaked the last mile. After a couple of practice runs, we managed to catch this nice striped bass on the Hudson River just below the Troy Dam. We caught the fish during the falling tide. The current was noticeably stronger when we caught the bass than during all the times when we didn't catch bass. The process involves first catching herring to use as bait. We only had one bait-catching rod on the boat with a Sabiki Rig. For twenty minutes the herring eluded my attempts. Finally, fed up, I handed the rod to M, and of course on his first cast he caught bait which put us in business. Almost immediately after rigging up the heavy rods with herring-chunked hooks and weight, something chomped away at M's bait but didn't stick around long. Soon my rod started seeing the same action, including some serious tugs and pulls. The fish and I fought for a while, and upon seeing the boat the big guy took off, but eventually M netted the beast, and snapped the picture. After the bass, we caught several catfish, and M had an eel on his line at one point. We had gone out a week before when there were probably 25 or 50 boats out there. Today, there was just us and another boat or two. I wonder where everybody went? On both days my canoe was the smallest vessel on the water by far. Everyone else had a motorboat of some kind. Finally, the first real rain of the entire season. The forecast called for 100% chance of rain for most of the day totaling more than an inch of rainfall. It never downpoured, but rained steadily throughout some of the night and all day long. At its peak while we paddled, the water level gauge for the Mohawk River in Cohoes reached 40,000 cft/s. For reference, I consider 3,500 to be very low, and 10,000 to on the low-end of high water. 120,000 was the level at the peak during Irene. The first 2 miles were pleasant and easy through the large marshy area. We paddled through an area of tall dead trees where several giant blue herons were flying around their sky nests. It was here that J discovered that his ship was steadily sinking. The long kayak drag to today's put-in had worn a small hole in the back of his kayak. Taking on water would mean lack of control and stability as the boat filled with water followed by regular stops to dump it out. Throughout the ride, the high water level elevated us over many obstacles, although there were several logs requiring either walking around or some fancy footwork to get past. Small portages were always a good opportunity to dump water out of the kayaks. During mile three, the water was swift but generally manageable. Mile 4 involved 60 feet of elevation drop, and there was plenty of water to rush us through it. The thrilling roller coaster ride required intense paddling to survive, and we didn't whoosh through without a few flips. No sooner had we survived the long series of rapids when three tunnels under interstate 87 presented themselves, side-by-side all descending into parallel darkness. Choose your fate. Without much to go on we picked the rightmost one with slightly more water than the others. The inside of the tunnel was completely disorienting. At the midpoint, the tunnel took a left turn, so there were no visible guarantees that there would be an exit on the other side. Our boats, paddles, heads, and hands deflected back and forth against the unseen walls like bowling balls at a five-year-old's bumper bowling birthday bash. The water level at the end of the tunnel was higher than at the beginning of the tunnel, so as we proceeded, the walls were literally closing in around us. A faint spot of light slowly came into view. My sense of direction was so completely lost while floating in the absolute blackness that I mistook the spot of light for a sewer grate on route 87, far overhead. However, as we got closer, the spot of light set like the sun until it reached the horizon at which point it was a huge relief to realize it was in fact the exit. 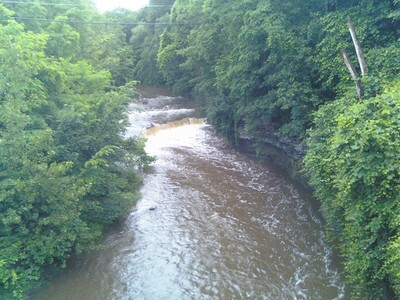 After the tunnel, the creek spread itself out into a large floodplain. Water was rushing through ordinarily dry grass and bushes. At one point J pointed out that "the river is over there". 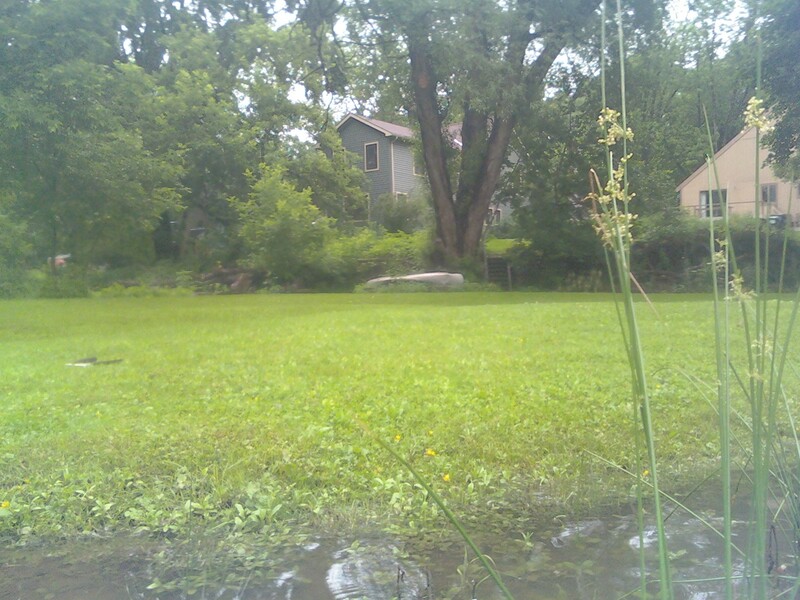 We were kayaking comfortably over a grassy field, and clearly the actual creek was a hundred yards to our left. 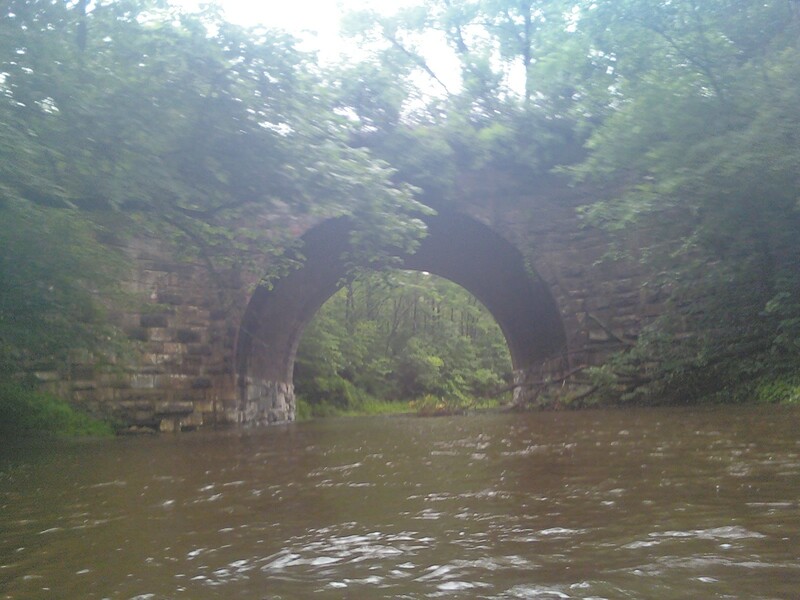 The only remaining obstacles were a few low bridges before we reached Round Lake and completed the trip. The ride was pretty outrageous, and both of us were happy to be back at the car by the end of it. 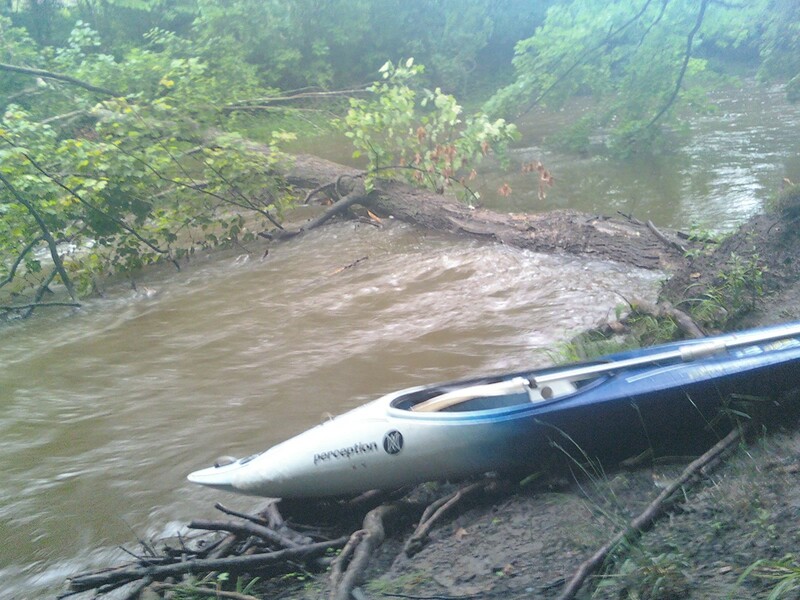 We have come along way, but today's rapids tested our limits to be sure. 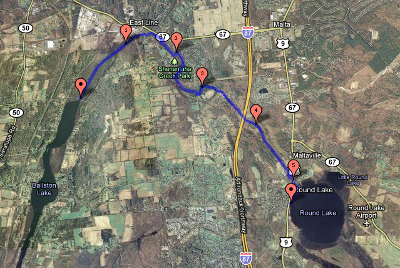 I kayaked the length of Ballston Creek from Ballston Lake to Round Lake. 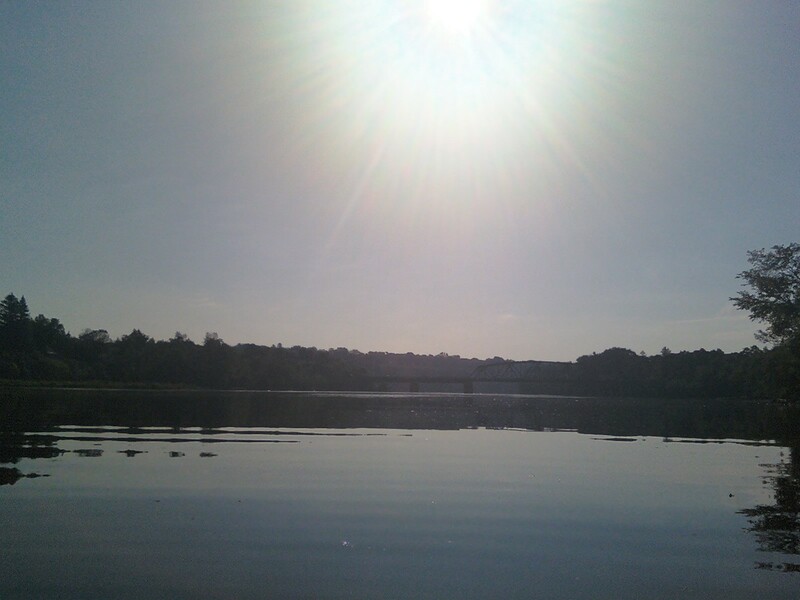 This was my first trip out in the kayak, besides a very short paddle around Ballston Lake a few days earlier. I had to learn as I went. It was pretty scary at times with the fast moving water, the lack of helmet and spray skirt, and my own inexperience. Once a branch clonked my head. 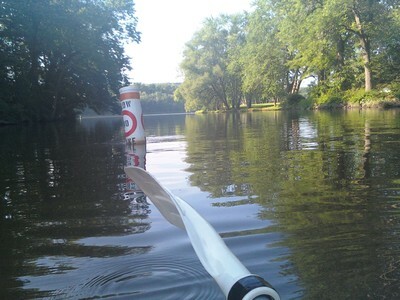 I was scared because I had no idea how the kayak was going to respond to conditions. The kayak had felt a little awkward in the lake with no current, but it turned out to respond really well in the fast-moving water. Getting over my fear was largely a matter of learning that the kayak was capable of handling some situations without my influence. After the swampy section, the creek's fast moving water was scary, particularly at first because I hadn't figured out how to bail out in fast moving water before a difficult spot. I eventually got better and learned to hop out of the boat and walk to shore. My guess is that the area is not usually kayakable, but with the high water after the recent snow melting, it was a bit of a bushwhack, but not too bad. The water was quite cold, as Ballston Lake was still frozen over. I was wearing mostly wool, and stayed luke warm even after wading chest-deep in water once or twice. I took a few breaks to sit in a sunny spot to fight off the cold. After I reached Round Lake, I locked up the kayak, and ran back to the car. I saw a pair of northern pike in the marshy section near mile 1. One looked huge, and was probably several feet long. Around the same area, there were lots of huge nests in the trees. I believe they were Great Blue Heron nests. There were hordes of ducks and Canadian geese along the way. I saw 2 little creek chubs in the small stream section. I also saw a giant carp in Round Lake. * Ballston Creek Preserve - Some hiking trails that bring hikers to the Heron nests. 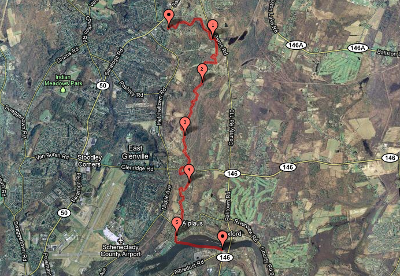 I ran barefoot through the Vischer Ferry Preserve on the south end of Clifton Park today. I would have worn shoes, really, I would have, but I was in a bit of a time crunch and didn't want to waste the time or gas to stop home before running through the preserve. I had no shorts in my car, so as if I didn't look enough like Huckleberry Finn in bare feet, I ran in my blue jeans with the bottoms rolled up to keep them from getting too muddy. Goose droppings peppered the northern canal path. I kept a wary eye on the ground and successfully avoided all land mines as far as I could tell. Several goose families hung out on the path. 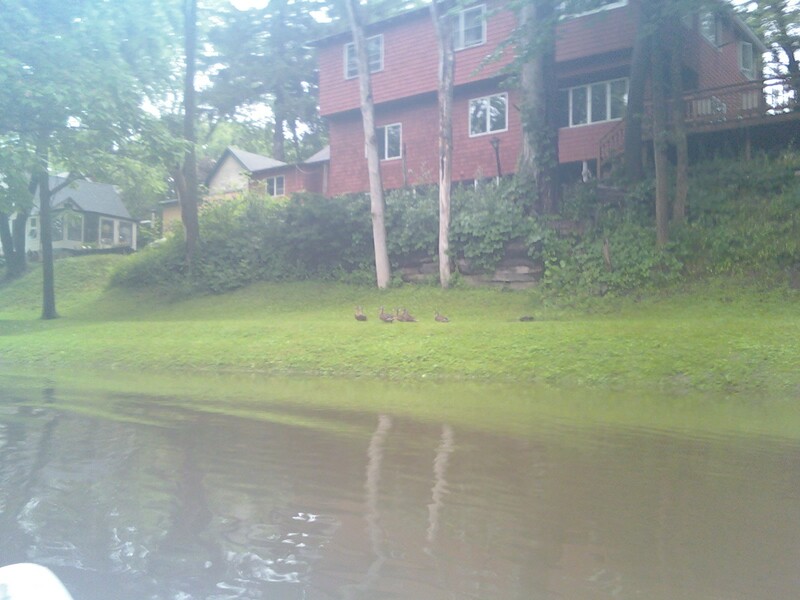 They generally waddled into the water as I ran by. 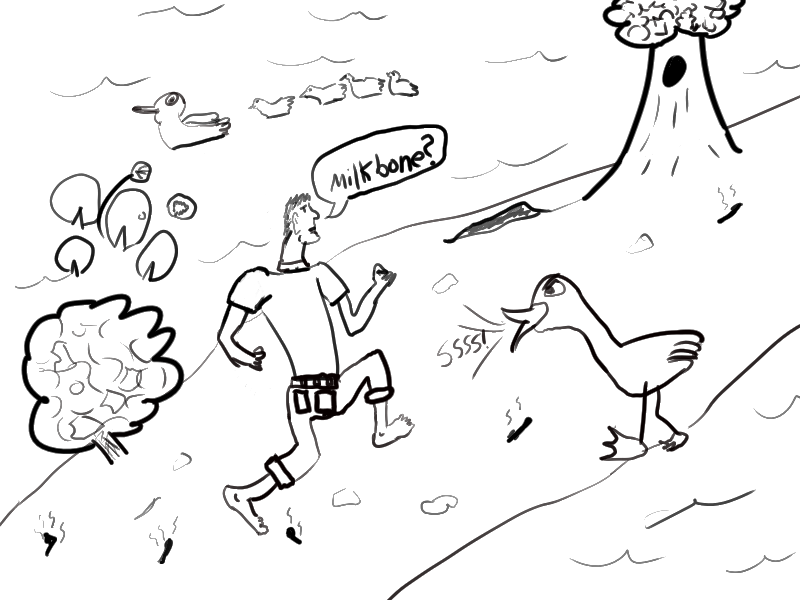 One brave papa goose stayed on the trail to protect the gaggle by hissing at me. I spoke friendly words to him as I passed by, then got the heck out of there as quick as I could. I ran to the far end of the preserve and made a u-turn. I took some alternative trails on the return trip. Eventually I arrived at a big huge sand pit that looked like the type of place where a person would pretend they never buried a terrible nuclear hazard. Construction vehicles were parked alongside and inside the sand pit. During an unfortunate footstep, I felt multiple small points poke into my foot. As I lifted my foot again, I could feel the points popping back out of my foot. I stopped and turned around to look at what I had stepped on. It was an old, frayed, rusty wire, with many rigid strands pointing upward out of the sand. I decided I wanted away from this area, but the southern trail was all construction-yardy. I recalled from cross-country skiing during the winter that there was a trail to the north. The only way north beyond the pit was to run through the thick weedy woods (not the snowy flat landscape I remembered). Unpleasant as it was, and longer than I expected, I eventually made it to a trail. Shortly thereafter, I felt a speck of itch on the side of my right foot. I reached down and scratched it, but there was nothing there. Then I felt another itch on my left foot. Then I felt severe tingling all over my feet. For a moment I panicked and thought that accute tetanus was gangrening my feet from stepping on the rusty wire. I slowly recognized the distantly familiar feeling of stinging nettles, and my panic subsided. Nettle stings don't last very long after itching and burning for a few minutes. I quickened my pace. I was running late and I desperately wanted to get home to wash my poor feet. They deserve better than this. I got home, washed and disinfected my feet, had some dinner, and made a quick visit to Urgent Care. The rusty wire was just the poke I needed to remind me to go get a tetanus shot. If anybody should be up-to-date with that particular shot, it's me. Today I looked into some questions regarding herring in the Hudson River. Is it legal to catch herring for bait just below the Troy dam? Yes. 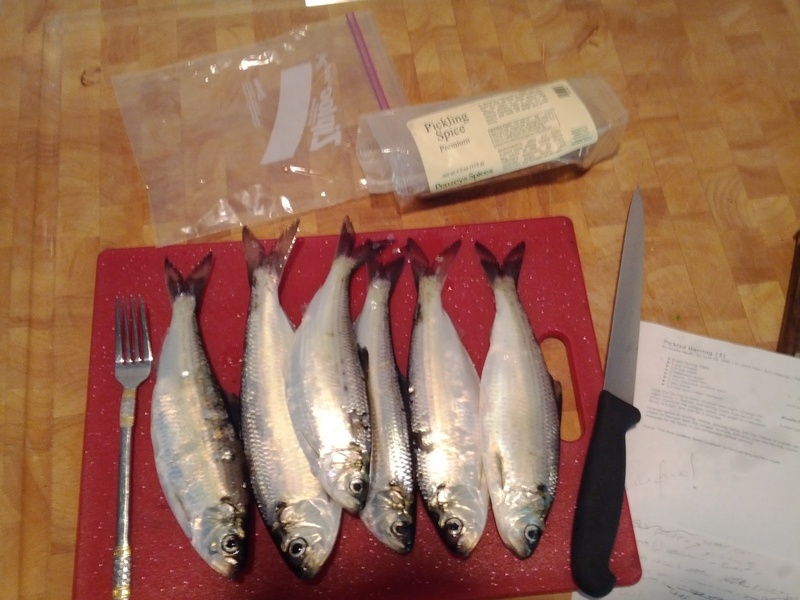 Possession of the proper fishing license entitles an angler to collect alewives and blueback herring for personal use in hook-and-line fishing only (sale prohibited) by angling, seine or cast nets. Regulations vary by location. Transportation of herring for use as bait is prohibited except along transportation corridors outlined and mapped in the regulations guide. The area around the Hudson River below the Troy dam is one such corridor. Is it legal to catch herring for eating? When is open season? What is the limit? Yes, herring can be caught any time, with no limit in the Hudson River upstream to Troy Dam, and some parts of the Mohawk River, and also in all tributaries from river upstream to first barrier impassable by fish. Anglers must enroll in the Recreational Marine Fishing Registry. Once these species are transported away from the water body, they may not be transported back to any water body for use as bait. 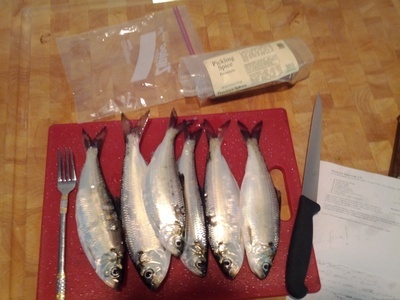 Is it safe to eat herring from the Hudson? What are the recommended restrictions on eating them? If a person were to eat Hudson River fish at a rate greater than the recommended one meal-per-month, they could expect to eventually end up with twice as much mercury in their system as a person who did not eat these fish. The person would still be well within the limits that the EPA recommends as "safe", although I don't have confidence that "safe" actually means "safe". I conclude that as a grown man, eating a few Hudson River pickled herring should be ok (with some warranted hesitation and disclaimers). Women of childbearing age and children under 15 should avoid them. I was surprised to read that the upper Hudson is the worst area to eat fish, and that the lower Hudson contains healthier fish. I expected that the further downstream you get, the worse the water would be because there would be more factories contributing to the pollution, but apparently this is not the case. It makes sense assuming that the largest concentration of pollution is in the sediment at the bottom of the river in the upper Hudson, and the fish in question spend a lot of time in the contaminated areas. 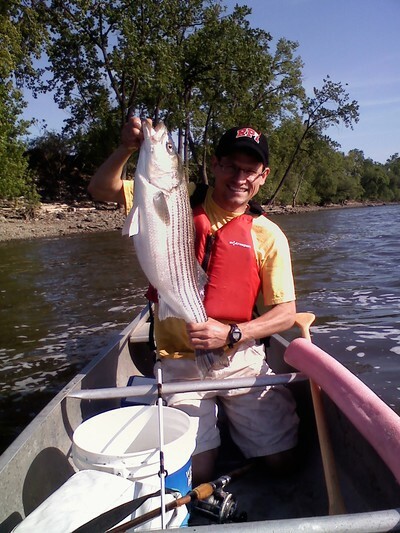 However, don't the striped bass spend only a short time on the Hudson while spawning? How are the striped bass on the Upper Hudson getting so badly contaminated if they only spend a small part of their lives on the Hudson? Does the contamination stay with the fish, or does it quickly leave the fish once it leaves the contaminated area? If the contamination quickly leaves the fish, then it would make sense that the fish in the cleaner, southern part of the Hudson are healthier. However, if the fish are permanently affected, then wouldn't they be just as contaminated when they are in the upper Hudson as they are in the lower Hudson? Or even in the ocean for that matter?